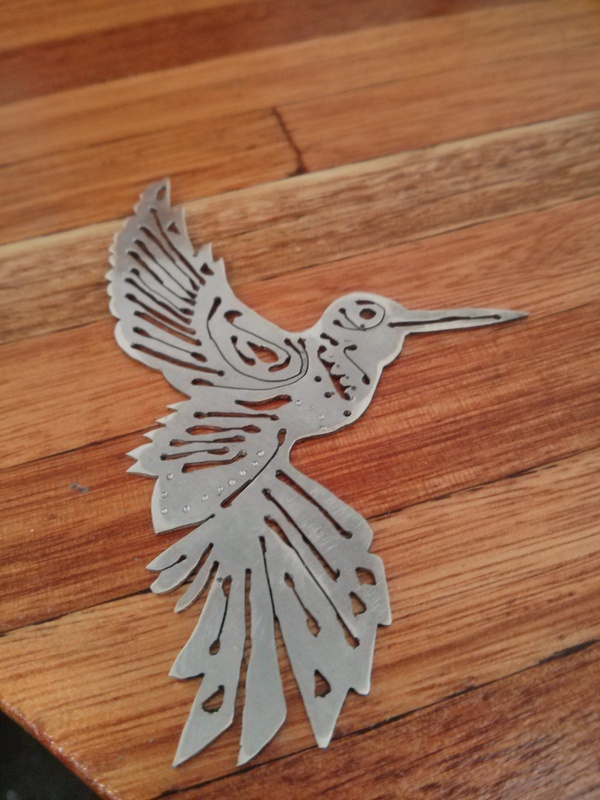 Yesterday I detailed the first Hot Metal project I made at Jewellery School. It took me months. I’m gradually speeding up and have since made a few more pieces. What to make in jewellery school for a guy who doesn’t wear jewellery. This was a quick and easy project. I decided I would make a little something for my jewellery benefactor (Mr Incredible) to keep him sweet. 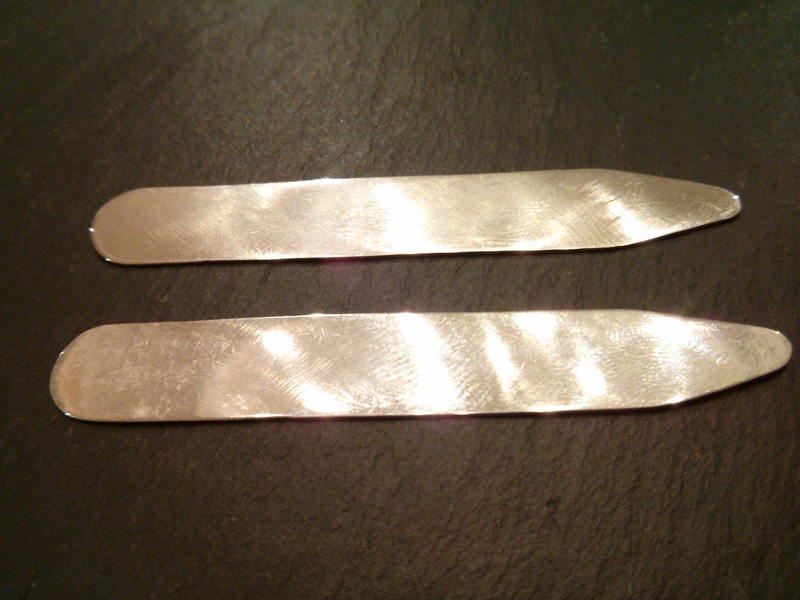 It involved thinning down a piece of metal plate, tracing round a collar stiffener (twice) that I pinched from home and then cutting the two new stiffeners out with a saw. Once they had been neated around the edges with a file it was time to polish them. Sterling silver is an alloy, which is 92.5% fine silver and 7.5% of another metal, generally copper. The copper toughens up the soft silver and prevents your finished item from being too easily damaged. When you anneal the silver, some of the copper can rise to the surface and looks like a cloudy bloom. This is called blue silver and you need to keep filing and polishing until it’s gone. Unfortunately, this means multiple visits to the polishing machine. You end up with filthy hands and whatever you are polishing gets quite hot. I’m not on friendly terms with the polishing machine. It nearly ate my first project. Also, every time you polish metal a tiny bit of the metal gets polished away. Too many trips to the polishing machine means that hypothetically you could polish your whole thing away into thin air. 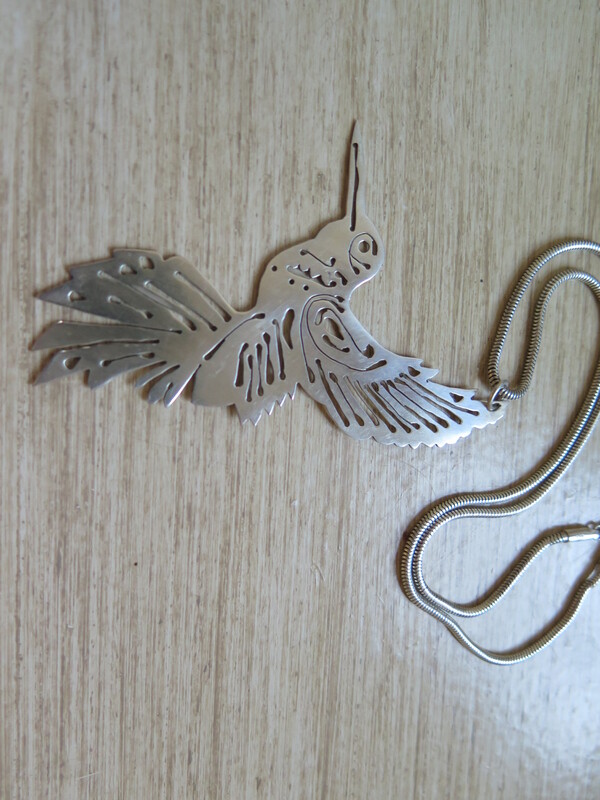 This bird pendant is inspired by a picture I saw Sweetpea’s colouring book. I made a smaller, amended version of the picture, then pierced it with a drill and saw. I’ve borrowed the colouring book on a long-term basis and it now lives with my jewellery kit. Can you see how all the tips and edges are shiny and the rest of the bird is ‘cloudy’? That’s blue silver. Polish, polish and polish. Blue silver banished and ready to wear.